If you’re looking for fast-paced excitement, give yourself a big pat on the back and a high five – you’ve found the right game. Here, you’ll find everything you need to get the nonstop fun started with Carolina Keno. What is Keno? you ask. Well, let’s just call it the perfect companion game for a night out. Or a day out. Heck, even a morning out. After all, any time of day is the perfect time for the chance to win $100,000! Especially when you can play at your favorite pub, restaurant or convenience store. Don’t have a favorite convenience store? Well, you do now. For just a dollar, you get a shot at big-time prizes every five minutes, and you can play as long as you want to stick around. And you find out if you’ve won in just minutes, not days. So, take a break from the same-old, same-old and make some memories worth remembering with the game of thrilling, nonstop match-making action. Meet Keno. Carolina Keno is a fast-paced lottery draw-style game that’s easy to play, with a chance to win great cash prizes every 5 minutes. 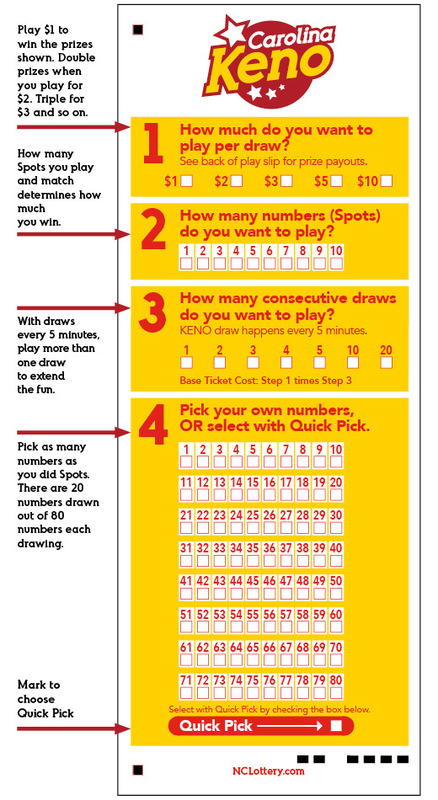 For each Keno drawing, 20 numbers out of 80 will be selected as winning numbers and displayed on the monitor. You can decide how many of these numbers (called Spots) you will try to match and exactly which numbers you will try to match. For example, if a 4-Spot game is selected, a total of 4 numbers from 1 to 80 would be selected. If you played that 4-Spot game for $1 and matched your 4 numbers to 4 of the winning numbers for that draw, you would win $75. Decide how much to play per draw. Each play costs $1. Play for $2 to double your prize; play for $3 to triple your prize and so on up to $10 per play. Select how many numbers to match from 1 to 10. In Keno, these are called Spots. The number of Spots you choose and the amount you play per draw will determine the amount you could win. See the prize chart to determine the amount you could win with a $1 play. Select how many consecutive draws to play. Pick up to 20. Drawings happen every 5 minutes. Pick as many numbers as you did Spots. You can select numbers from 1 to 80 or choose Quick Pick and let the computer terminal randomly pick some or all of these numbers for you. Approximate overall odds to win a prize range from 1 in 3.86 to 16.63. 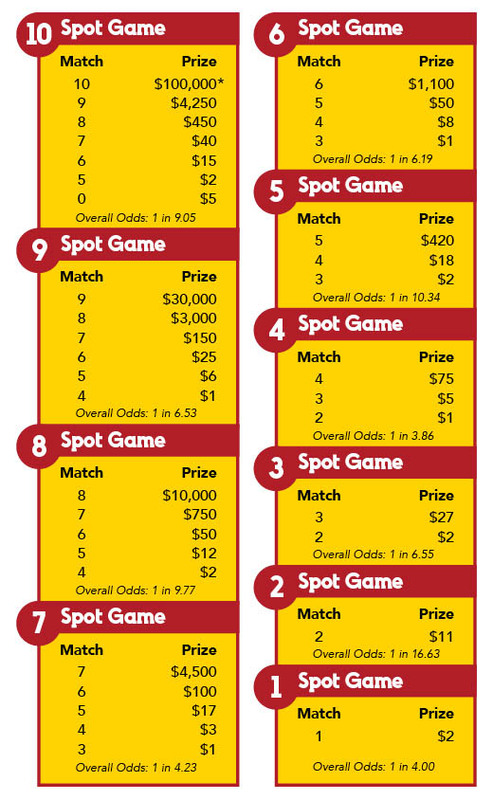 Approximate odds to win the top prize on the 10 Spot game are 1 in 8.91 million. If more than $1 is played per draw, multiply prize amount shown by amount played. Some prizes may become pari-mutuel under certain conditions as defined in the game rules. Keno is designed to let you pick the prize you want to play for. Just use the prize chart to decide what is fun and exciting for you. If you definitely want to play for $100,000, then you’ll need to select a 10-spot. Maybe you are looking for the very best odds to win; that would be a 4-Spot. Check out a 6-Spot or a 7-Spot too. There are lots of great prizes to choose from. And there’s more than just the top prize amount for each Spot option. A 9-Spot, for example, offers a prize for matching 4, 5, 6, 7, 8 or all 9 numbers played. How much you can win is determined by how many Spots you choose and how much you choose to play. A Keno ticket may be canceled at the location where it was purchased up to 6 seconds before the drawing time. The ticket, not the play slip is your proof of purchase. So be sure to verify your ticket and sign your ticket immediately.